Will Medicare Pay for a Hot Tub? Are Inflatable Hot Tubs Any Good? NOTE: 9-16-18 — for the most up-to-the-minute look at the very best hot tubs under $500, click here. You arrive home exhausted by a one-hour, traffic-clogged commute. Or, you finally put the kids to bed after a long hectic day. You’d like nothing better than a long, relaxing soak in your backyard hot tub. Only problem is, you don’t have one. You checked on the possibility of having a hot tub put into that secluded little spot on your patio — just outside your master bedroom. But every hot tub sales place you went to wanted to charge you anywhere between $2,100 and $10,000 for an acrylic above ground spa — and that’s without the added cost of a surrounding enclosure. And those really nice in-ground spas will set you back between $15,000 and $20,000. Ouch. Sure, it will increase the value of your home — a little. But you don’t want to take out a second mortgage to make it happen. Surely, you think, there has to be a portable hot tub that’s affordable. One with soothing, massaging bubbling waters set at a steamy temperature somewhere north of 100 degrees. And, sure enough, a list of hot tub sites shows up. You pick one near the top and tap to open the website. There are five hot tubs that are both easily inflatable and highly portable. And they range in price from under $350 to just under $500. Are these deals too good to be true? Some are made of highly durable, cloth-covered vinyl. Some have walls that are reinforced with triple-ply fibers. One even comes equipped with a built-in light show. Wow. But how hard are they to set up and — if they really are portable — how hard are they to take down and transport? Hmm. It would be nice to be able to take one on vacation at the beach this year. It would make your place the ideal spot to party. NOTE: Scroll to the bottom to view five videos on these hot tubs. Click here for the lowest price anywhere. We tested this little hot tub thoroughly before coming to the conclusion that it deserved a top slot. It has received more than 275 five-star reviews from the tough critics on Amazon. It’s the real deal. The bubbling jets are terrific for soaking away the day’s stress. If you’re expecting those pounding streams of hot water you get with higher-priced spas, you’ll be disappointed. But for most people, these “rolling bubbles” are just fine. This portable hot tub only needs a regular 110 AC outlet to do its thing, keeping your electricity bill way down. Our bill only went up by about $6 a week, using it every other night. After using it, we cover it and set the thermostat at 85 degrees. Then, as soon as we get home, we run it back up to 104 degrees. Takes about two hours to ramp back up, but that makes it just right for an after-dinner soak or before bedtime experience. Other notes: Sides are composed of a tough, cloth-covered vinyl. And, we believe, it provides a quality spa experience at a most affordable price. Unlike most other hot tubs, this particular model only has 60 “jets” bubbling around the rim, Not sure what the designers rationale was for having so few, but unless a powerful stream of bubbles is a priority for you, most folks don’t mind trading that off in order to get a lower price. And, like any other product, there have been a few that have become problematic after several months. Most negative reviews we found reported problems after disassembling their unit for the winter months and then trying to use it the following year. Our solution — keep it up year-round and always ready for a hot soak — even with snow on the ground. Coming soon: a link to tell you how. We’re rating this hot tub highly mainly because of a couple of features that are really handy: the easy-lift handles that allow you to more easily transport the unit from, say, your back yard to a vacation home for a week in the summer or winter. And, in our opinion, the digital controls are a wee bit more functional and intuitive than other units. Watch the setup video below to see just how easy the controls are. Another great feature of this spa is the ability to enter in the time you want the spa to begin heating up. This is handy if you want to save a little electric bill money by keeping it at around 85 degrees all night and for most of the next day. But you can set it to begin heating at, say, 3 o’clock in the afternoon so it will be hot and ready for you when you get home. It inflates within minutes and the rapid heating system heats the water up to 104 degrees F. it takes upwards of 20-24 hours to go from 68 degrees to 104 degrees. But, then all hot tubs do. One in five buyers overall had a complaint about poor setup directions (that’s what the DVD is for) and for various other issues. Main takeaway ; even if it doesn’t last more than a season, we feel at this price it still provides a convenient, out the backdoor spa experience for about a dollar a day. 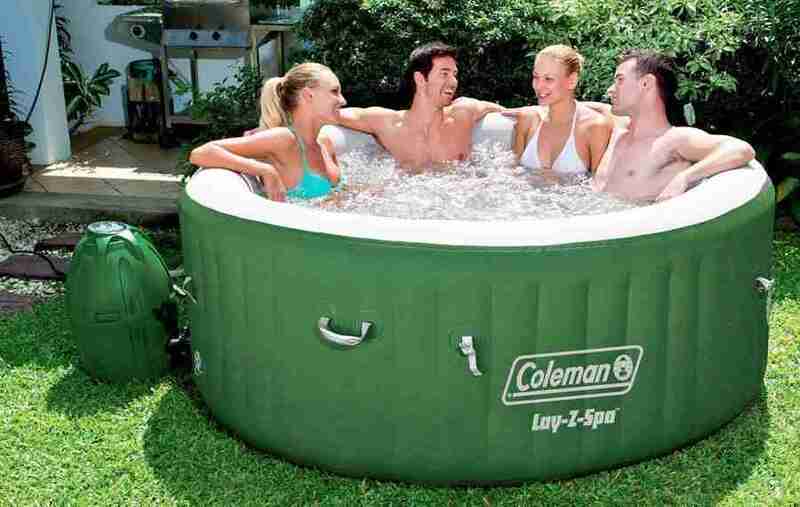 Here is a compact little inflatable hot tub for you and three of your closest friends. In our opinion, this tub has a little less functionality than the first two above, but is still a great option for the low cost. As you can see in the setup video below, it features ultra-easy hookup, with the ports conveniently labeled A to A and B to B. Plus, this hot tub’s cover has an aluminum foil undercoating to help the spa retain heat and keep electric costs down. Once again, as with all Coleman models, portability remains a key feature. You can literally put it up within twenty minutes. Deflation for movement to another location, of course, takes a bit longer as you’ll want to make sure it’s completely dried off before packing it up. With more than 800 five-star reviews, it’s obvious that Coleman pretty much has their quality control in order. Still, a few defective units seem to have made their way out the door of the factory. Random pump failures and leaks have been reported. But they are way in the minority. This Intex model spa comes in at the number 4 slot because it has a number of cons that almost outweigh its pros. But, having said that, many people swear by these sturdy hot tubs and would readily buy a second one. Improved, durable sidewall construction that will firmly support a grownup sitting on the rim, dabbling his feet and legs, or taking a breather from the hot water by swinging his whole body up and out. Second pro, in our opinion, is a more accessible control panel — one you can easily reach without standing up or getting out of the spa. The water will start cooling down after running the jets for 30 minutes. But if you’re okay with no jets for awhile, it won’t matter. Second con is the unhelpful advice you might get from customer support after six or eight months of ownership, when some customers report a problem with the heating unit. In point of fact, however, there are many folks who rate this product as five-star, so it might work out great for you at such a (relatively) low price. The SaluSpa with LED lights that we tested is very cool, causing our friends to ooh and ahh while sharing a few hot tub hours. First, the good news: everything is pretty much as advertised right out of the box. Easy setup and fill. Takes quite awhile (over 8 hours at 2 degrees heating ability per hour.) But once it’s hot, it stays hot — so long as you don’t run the bubbles much longer than 30 minutes at a time. 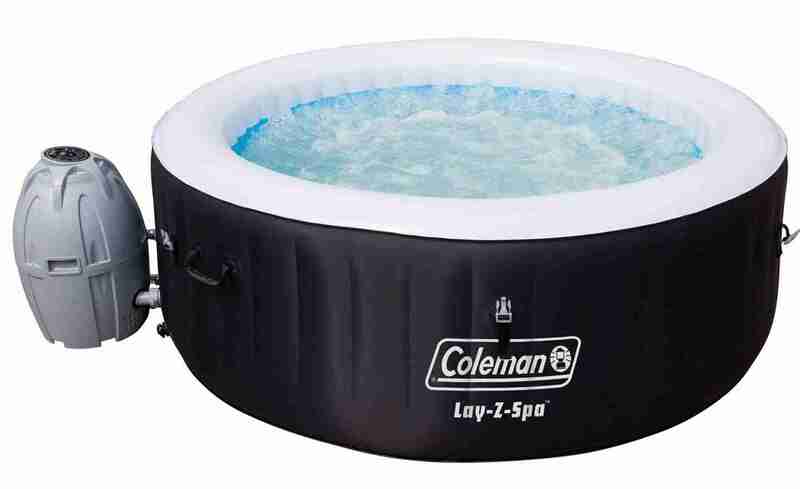 Second, at 77 inches across, it’s a little more roomy than even the number one Coleman above (made by the same company, by the way), It also features handy handles for carrying it about (when deflated and packed) and the soothing jets provide the requisite bubbling relief as all the other hot tubs on this page. The bad news is, there are almost as many 1 and 2 star ratings as 5 star ratings, which is always a troubling sign. 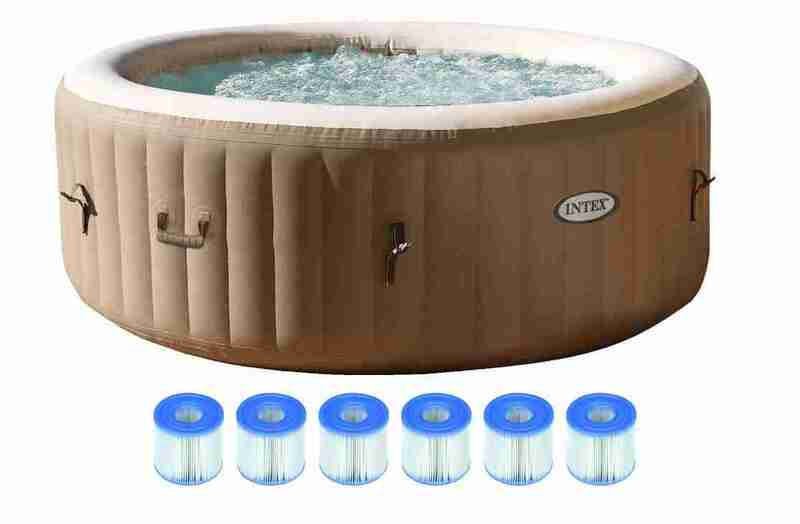 Nothing any more terrible than the heating issues and other minor upkeep issues we’ve mentioned with other hot tubs. As we said, many people rave about the added room and the fabulous LED lighting array. So, as we round out this list of Five Cheap Hot Tubs Under $500, it’s worth remembering that you sometimes get what you pay for. So. It is definitely possible to have that relaxing soak at the end of the day after all, perhaps with your significant other and a chilled glass of wine. FINAL NOTES: We make no guarantees about your personal experience with any of these hot tubs. We’ve offered pros and cons on each one. Read those and consider carefully before buying. Are Inflatable Spas Any Good? A vigorous debate is currently raging among folks who want the soothing benefits of a portable, inflatable hot tub or spa. But they (a) don’t want to pay a fortune for them and (b) want to make sure they’re durable. A little fact-checking (as they say in the political debates) is in order. Inflatable spas have come a long way since they were first introduced to the market several years ago. Nowadays it’s possible to get a very affordable (under $375) soft-sided hot tub that’s surprisingly sturdy. Who are the leaders in the field? There are several models put out by camping gear leader Coleman. And they are consistently ranked highest in customer satisfaction. First, these spas have a tough, cloth-covered wall that’s firm enough to sit on, yet inflate within minutes. Second, the floor is padded (that’s also where you sit) and they come in both a four-person model and a roomy six-person version. One version (the Lay-Z-Saluspa Paris) even has a built-in light show. This dandy control panel allows you to set the temperature to a steamy 104 degrees F.
Finally, in addition, a powerful motor pushes a stream of massaging bubbles through 120 jet nozzles around the spa’s upper perimeter. Who has the most durable construction? The Coleman brand, while the most inexpensive, doesn’t boast the most durable walls and filtering system in the industry. That distinction goes to a company called Intex. Intex puts together their inflatable hot tubs with patented, three-ply high-strength fibers woven into their side walls. This makes them virtually as steady to sit on as an in-ground spa. And, the Intex brand also features a unique hard-water filtration system. Both the Coleman and Intex brands come equipped with easy-to replace filter cartridges, floating chemical dispenser, and a carry bag with grab handles. As for reviews, both companies received scattered complaints about non-functioning components. These included such things as heaters that didn’t work properly and automatic shut-offs that kicked in too soon, resulting in a longer wait time for heated water. However, both companies responded to the concerns — Coleman more quickly than Intex, according to the reviews left on the Amazon site. Intex cover straps are lockable for added security. Finally, a major advantage of inflatable spas is that you can easily deflate them, pack them up, and take them anywhere. Take your tub to a vacation rental in the mountains or at the beach — or even to visit relatives for an extended time. As long as you can find a nice, level spot (on grass, wooden decking, or concrete) and have ready access to a garden hose and a 110 AC power source, you’re good to go. How long do they take to heat up? It depends on how cold the water is when you first fill the hot tub. The average temperature of water right out of your garden tap is around 68 degrees. Most customers of both Coleman and Intex spas reported that it took almost 24 hours to bring the temperature of the water to 104 degrees F.
However, after use, it drops to around 80 degrees with the cover back in place. Then, say owners, it takes only a couple of hours to raise the temperature back to 104. What about increased electric bills? It bears mentioning in passing that you should be ready for a spike in your electric bill while heating the spa initially. After that, while in maintenance mode, it just draws a trickle. Then, there’s a small increase when you bring the temperature back up. This rise in electrical usage will be especially noticeable if you decide to use your spa during the winter. Inflatable spas really are a good value for the money. $1.04 per two-hour session — even if the spa were only to last 2 years. That would give you a much better ROI than enduring the expense and landscaping disruption that would be caused by excavation for and installation of an in-ground hot tub. That kind of thing could easily run to $5,000 or more. So, are inflatable spas any good? The answer, across the board, is yes. You’re looking for a portable hot tub that will ease your daily stress, soak your tired muscles, and soothe aching joints. In short, you want to know the best rated portable hot tub on the market today. But where to find one that’s (a) affordable and (b) highly portable, so you can carry it to your vacation home, or for an extended stay at Aunt Sally’s, or wherever. There are many alternative options to the old-fashioned in-ground, brick and mortar hot tubs and spas. They’re called portable, inflatable hot tubs, and they have all the advantages of a traditional spa at a fraction of the cost. And, they’re highly portable. Construction. You need to make sure your hot tub is built to last more than one season. There’s no real way to know this ahead of time, but as a general rule of thumb, the inflatable hot tubs with interior reinforced construction seem to hold up best. Price. You can expect to find most inflatable hot tubs to be in the $350 to $800 range. That’s a sizeable investment. But, it’s nowhere near the cost of an in-ground spa. Warranty. Check out the warranty provided by each manufacturer before you buy. This will adjust your expectations and should furnish you with a customer service contact if you need new parts or — worst case — a replacement hot tub. Jets. Again, just so you won’t be disappointed when you climb into your hot tub for the first time, pay attention to how many jets your hot tub comes equipped with. 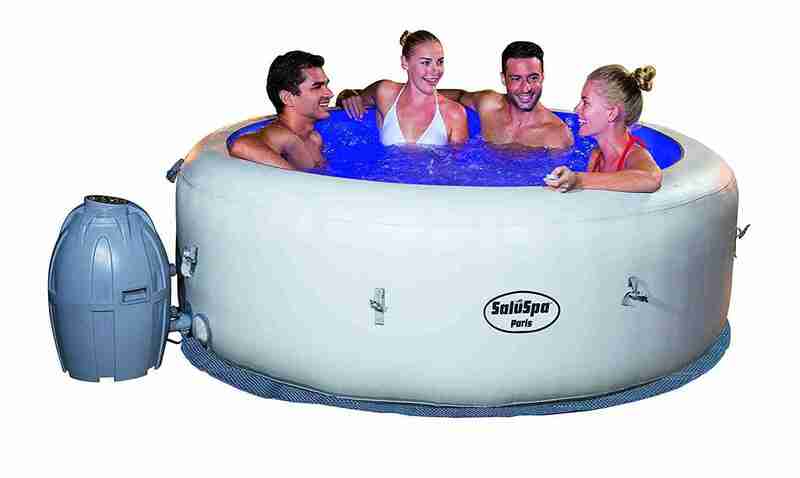 Generally, four-person inflatable hot tubs have 120 jets, while the larger six-person tubs have 140. And please understand that they produce a powerful stream of bubbles, not real jets of water, as you might be used to in the big commercial hot tubs. Covers. When you are making your selection, try to make sure it comes with a suitable cover. If not, you’ll need to buy one separately. They are important in order to keep heat in from day to day and in order to keep things like falling leaves out. Cleaning. This is an important weekly task. Try to ascertain how often the filters might need to be changed and what kind of chemicals you’ll need to keep the water nice and sparkling. Some of the hot tubs come with chemicals. Some do not and must be purchased separately. If in doubt, scroll down and read the fine print and specs on the Amazon product page. Or contact the manufacturer. In most cases, a simple trip to your local pool supply store will get you what you need, no matter what brand you might have. Reviews. If they’re available on the model you’re thinking about buying, check to see what people who have already bought the product have to say about it. The more five-star ratings and positive reviews, the better. Any product will have its share of discontented customers, for one reason or another. Take these reviews with a grain of salt, but see if you can tell what the company’s customer service department did (or didn’t do) to rectify the complaint. Voltage. All inflatable hot tubs that we know of come with connectors for 110-volt AC GFCI (ground fault interruptor). Your new item will pull some serious meter time and voltage — especially during initial warm-up. Not so much when it’s already reached its peak temperature (generally 104 degrees F). Breakers. Closely related to the point about voltage above is the issue of your breaker box. The outlet into which you plug your spa may not be able to withstand the extra demand. Thus, a breaker might trip repeatedly during initial heating. To solve this problem, either (a) run a heavy duty electrical cable to another receptacle or (b) have an electrician upgrade the amperage on the circuit you keep tripping. Storage. When the season is over (this is assuming you don’t intend to use your spa in both summer and winter) they deflate and fold up into a box about the size of an old fashioned steamer trunk, or a very large suitcase. You can easily pick it up and store it away in your basement, garage or storage shed. Or, if you’re particularly strong, you can even lug it up the stairs into your attic. Don’t let your aches and pains get you down. It could be the right time to ask your doctor for a prescription for a portable, inflatable hot tub. And Medicare may even pay for it. It never hurts to ask! Of course, you should be prepared to show evidence of your condition or injury, such a X-rays, MRIs, or other proof. And, your doctor should state precisely why he or she feels it is medically necessary for you to have the benefits of a soothing spa treatment in your own back yard. You should also know that Medicare — or any insurance provider — will likely only provide funding for a one-person tub. 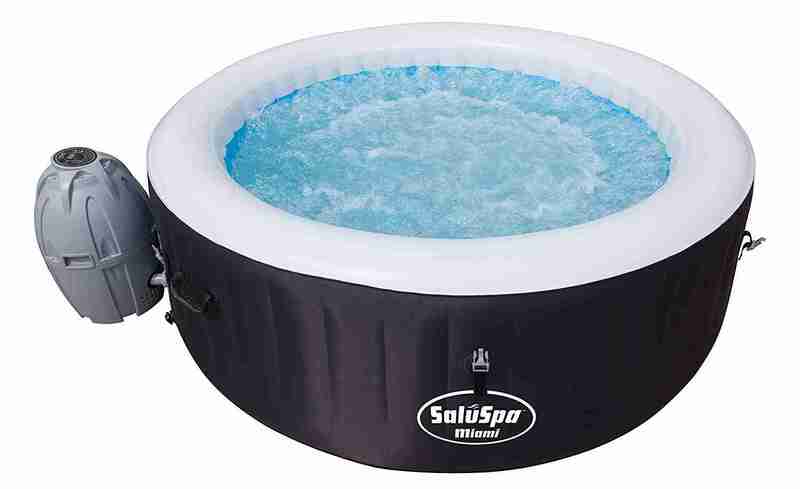 However, here’s a list of five portable, inflatable hot tubs that will easily accommodate you and up to three others. And all for significantly under $500. Check your Medicare Part B or Supplemental policy to see if hot tubs are specifically NOT covered before you go to the trouble of filing a claim. But, even if they don’t, the expense for a portable, inflatable hot tub is tax deductible as a medical expense (provided you hold onto the prescription and the receipt). So is the electricity that powers it (although this could get tricky — check with your CPA). Welcome! We’re glad you stopped by today. You’re thinking of buying an inflatable, portable hot tub as an alternative to spending thousands of dollars on a pricey in-ground spa. This is the website that will help you decide which hot tub under $500 is best for you. Because they differ greatly in quality and performance. Here, we try to educate and inform, rather than sell you on a particular hot tub. Then, if you choose to come back after doing all your research and use one of our links for your purchase – rather than going straight to Amazon – we’d really appreciate it. Amazon gives us a very small commission on each sale, but we like to think we earned it by giving you the helpful data you need to make a good choice. So start by reading the informational posts listed in the menu. You’ll find out quickly what you need to know about the differences between these hot tubs and their more expensive in-ground brothers. We wish you all the best!